If you’re a power Dropbox user you’re really going to like one of the features that’s coming up in its next update. When you plug in your camera, phone, or SD card, Dropbox will automatically import all the photos and videos and back them up to the cloud. Dropbox certainly isn’t the first to introduce this feature, but it’s one that’s going to appeal to the serious Dropbox users among us. The best part is, if you’re feeling a bit adventurous, you don’t have to wait to try out the new feature. You can download and test an experimental build right now. 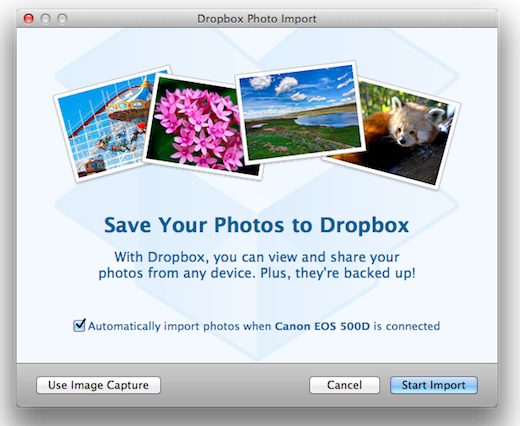 Once you’ve updated Dropbox, when you plug in your camera, phone or SD card, this window should automatically appear. While the new build (1.3.4) is available for Mac, Windows and Linux, the photo import feature is not available for Linux or Mac 10.4, and not all devices are going to be recognized. Android users should use the ‘connect as disk drive’ feature, and HTC sync will not work with the new feature. As usual, we strongly recommend making a backup of your Dropbox before upgrading to this build as we’ll need a few weeks to be certain of its stability. We will rapidly release new builds as necessary to snipe the most common issues as they arise.